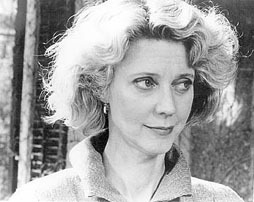 A child of wealthy parents, Blythe Danner enjoyed a prep school education, and spent a year in Berlin as a foreign exchange student. She was there as the Berlin Wall was constructed. She considered becoming a nurse, but couldn't stand the sight of blood. Instead she studied drama at Bard College, then performed in repertory with the Theater Company of Boston. She won a Tony playing a teenaged divorcee in Butterflies Are Free in 1970, and has been nominated three times since. In movies, her best reviews came for two adaptations of novels by Pat Conroy, The Great Santini (as Robert Duvall's long-suffering wife) and The Prince of Tides (as Nick Nolte's long-suffering wife). Her biggest box office success came in Meet the Parents and Meet the Fockers, as Robert De Niro's long-suffering wife. She also had memorable roles in Merchant-Ivory's Mr. and Mrs. Bridge with Paul Newman, Neil Simon's Brighton Beach Memoirs, and Woody Allen's Another Woman, Alice. and Husbands and Wives. For sheer camp, little could top Danner's performance in Futureworld, opposite Peter Fonda but dreaming of Yul Brynner. Her TV series include Adam's Rib (in the Katharine Hepburn role), Tattingers with Stephen Collins, and Presidio Med with Dana Delany. She is currently playing Hank Azaria's screwball mother on the Showtime series Huff.